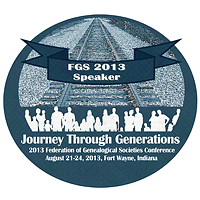 Okay… so you’re sitting there in the opening session at Journey through Generations, the 2013 conference of the Federation of Genealogical Societies in Fort Wayne, Indiana. It’s Happy Birthday, Sweet Sixty: The Roots of Rock & Roll and 1950s America — the genealogy of music! And if you’re sitting there thinking to yourself… what else is there at FGS that’s more in tune (sorry, couldn’t resist the pun) with modern times? Why, the answer is simple: technology and genetics as they’re used in genealogy, of course. Here are The Legal Genealogist‘s picks for best options of the conference in these areas. There are only four genetic genealogy presentations, so why choose among ’em? Go for ’em all! DNA testing terminology, the types of DNA testing (Y-DNA, mitochondrial, autosomal) and the benefits and limitations of each type of DNA testing are covered. Learn to link families using autosomal DNA test results from any testing company. Maximize impact on your genealogical research goals. DNA testing is radically changing the technology we use to connect with our ancestors and discover new family relationships. New technologies enable people to connect with their personal histories. Once You Have Your DNA Results, What Next? Learn how to understand DNA test results (Y-DNA, mitochondrial, autosomal). Benefits and limitations are illustrated. Some useful tools developed for the presenter’s DNA project are covered. There are a lot more options in the technology field. Things you may have already considered, and things that may be completely new. Here’s a round half-dozen of the ones you might find most useful. Genealogical learning is no longer restricted to a local classroom or a distant seminar. Hear about the many options you have, including blogs, webinars and web classrooms. Clip notes from the web, write notes, record audio or webcam notes and more. Sync your notebooks on the web with your computer and every mobile device you own. Published family histories are available in both printed format and on the Internet. You’ll learn how to maximize your searches to locate both print and electronic materials. Learn about free and paid every-word searchable eBooks that can be used online or downloaded to a reader such as Kindle, smart phone, or iPad. Covers choosing a scanner with the right features, techniques for finding your scanner’s “sweet spot,” and scanning various types of originals, such as prints, negatives and oversized originals. Learn about advanced search and other tools offered by Google. We’ll dig deep and learn how to make them work for your research.